“We really wanted to do something useful in response to the refugee crisis; something that would be of practical use, such as fundraising. 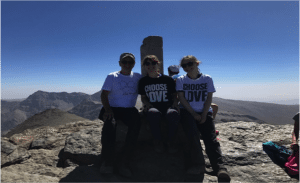 We became aware of the amazing work of Help Refugees, and decided to support it by taking on a sponsored challenge: climbing the 3 highest mountains in the Spanish Sierra Nevada, which includes the highest mountain in Spain, in one continuous three day trek. We discussed what our fundraising target should be and decided (with a little trepidation) to aim to raise £1,000. We got our MyDonate site set up in May, giving us about 4 months to get sponsorship. We also needed to get in some serious training – especially Bill! 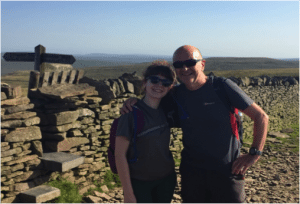 This included tackling the Yorkshire Three Peaks, a tough 24 mile hike over the three highest hills in the Yorkshire Dales, which is often done as a charity event itself. On the 15th of August, we flew to Malaga and picked up our hire car. We drove to Lanjaron, a town in the foothills of the Sierra Nevada, for an overnight stay and to meet our guide, Felipe, from the trekking firm, Spanish Highs. The following morning, we got the National Park bus to the road-head (well, a stony track-head really!) and started the climb over our first mountain, Alcazaba (3371m). This is a very remote peak, and it was a later than ideal start time: the noon sun was beating down as we set off. Not being acclimatised, the altitude took its toll (particularly on Bill!) and we were relieved to reach the remote, lonely summit around four hours later. We had the peak all to ourselves, its superb views of the surrounding wilderness slightly obscured by heat haze. We still had to get to the mountain refuge, Refugio del Poquiera, where we were staying that night. The journey involved many descents and ascents over mountain passes, until we thankfully arrived at about 7.30pm – pretty exhausted, to say the least! The next morning, we set off for our second summit, Veleta (3394m). We aimed to climb the peak, and return by a different route to the Refuge. Our approach to this summit from the south is remote, and involves at one place an ‘airy’ traverse..! The ascent from the south was in stark contrast to the northern side of Veleta, which has been developed for skiing and has tracks almost to the summit. It was weird getting to the summit and suddenly meeting lots of people who had been driven nearly to the top from the other side! Once the obligatory summit photos were taken wearing our Choose Love tee shirts, we set off away from the crowds and didn’t see anyone else until we returned to the refuge by late afternoon. It was an early start from Refugio del Poqueira to climb Mulhacen, the highest point in mainland Spain at 3478 meters. Although very tired by now, we were acclimatised to the altitude, and the early start meant that we gained quite a lot of distance and height before the sun found us. The final stretch to reach the summit involved ‘zig zagging’ up relentlessly steep scree (loose stones), until at last, we were there: we had reached our final summit of this challenge! 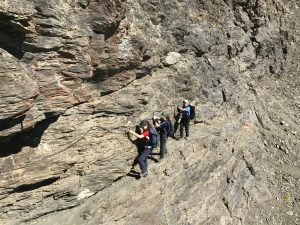 It being the highest mountain in Spain, we were not alone – but the feeling of camaraderie between everyone who had made it was brilliant, and overcame any language barriers. It was a long hike from the summit to the road-head, where we got a lift back to Lanjaron. Welcome drinks, showers and a celebration meal followed – in that order! The next day, we became regular tourists and visited the beautiful city of Granada. What a brilliant surprise to come across this sign declaring ‘Refugees Welcome’! This challenge was tough and the questions did get asked at times: “who’s idea was this, Dad? !”, or “why are we doing this, Dad?!”. 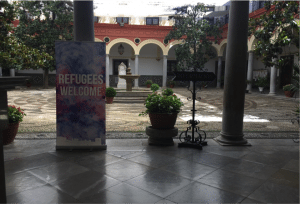 The answer, and what kept us all going, was that we were doing something in response to the ongoing refugee crisis. We hoped to raise awareness of the need and to encourage everyone, including the UK government, to do much more to give shelter and support to desperate displaced people: fellow human beings. We surpassed our target, raising £1,160 to assist the work of Help Refugees – which is what made it all worthwhile! Help Refugees are so amazed by, and so grateful for, everything that Bill, Morag and Rhona have achieved! Thank you so much to the incredible Innes family. 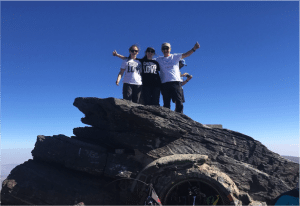 If their trip has inspired you to do a similar #ChooseLove challenge, then you’ll find more information on the community fundraising section of our website. Alternatively, if you aren’t keen for such an energetic adventure, then why not have a look at some other examples of fundraising – a mini-festival or a Christmas event, perhaps? As ever, our work depends on the generosity of people like you. If you are able to help us continue helping others, please donate here.